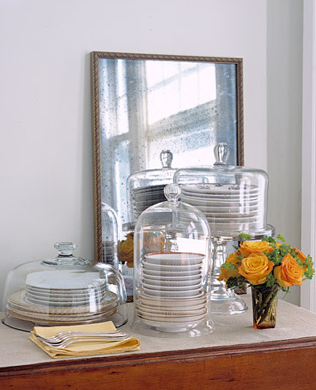 Who needs a china cabinet when you can display your dishes like this? This is another idea by Martha and her team, and I think it's brilliant. I have a china cabinet, but love the idea so much that I still want to do this with my extra dishes. You could also use this idea to put out any china you've inherited over the years. I'm sure your grandmother would rather see her pieces out on display rather than stuffed away in storage anyway.